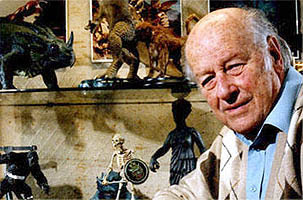 Ray Harryhausen was born June 29, 1920 in Los Angeles, CA and is an American Film Producer. He is more commonly referred to as "the father of stop-motion animation". He has designed some of the most memorable creatures ever seen on film. Most notably known for his work in movies like The Beast from 20,000 Fathoms, The Seventh Voyage of Sinbad, Earth vs. the Flying Saucers, Jason and the Argonauts, First Men in the Moon, Clash of the Titans and many, many more. Unusal Fact: Harryhausen worked alone on his stop-motion animation sequences, sometimes shooting no more than 13-14 frames of film per day. Because of this, project completion could take upwards of 2 years. How many creatures and films can you name from the clip you just watched? Bubo is Athena's beloved magical owl. Zeus commands her to send the owl to Perseus to aid him in his quest to save the princess. She refuses, and with the assistance of Hephaestus, she decides to switch the real owl with an exact replica made of brass and iron. Gentle Giant is producing a 7 inch version of Bubo ... a Limited Edition of only 500 pieces. It will include a Certificate of Authenticity. Pre-ordering now at Entertainment Earth with release scheduled in June 2007. 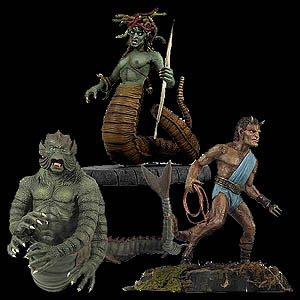 Fans of stop-motion animation and Ray Harryhausen special effects will be interested in this set of creatures from the movie Clash of the Titans. The set produced by Gentle Giant includes Medusa, the Kraken & Calibos which are all rotocast and stand 9 inches tall. 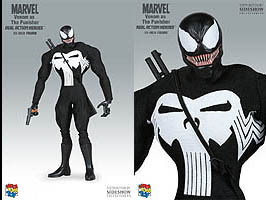 During an unusual 'What If' storyline, the alien symbiote Venom, after leaving Spider-Man, supposedly joined with The Punisher [Frank Castle] for a short time. Medicom Toy continues its line of Real Action Heroes with this Limited Edition 1:6 Scale [12 inch] figure. Medicom's RAH line has one of the most poseable bodies on the market today.